Equipped with a full range of technology and engineering capabilities, Hafendorfer Machine, Inc. can transform your design from concept to reality with our metal bending and metal forming services. Our facility contains the latest equipment enabling us to fabricate and perforate metal to the most exacting tolerances. From complex assemblies to simple brackets, we have the technology and expertise to complete any bending or forming project. 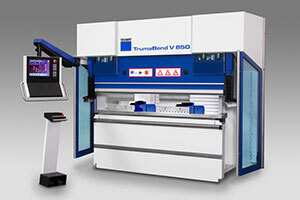 The 11 Axis TRUMPF TrumaBend V850 CNC Press Brake we can provide our customers' high-quality, precision forming of material up to 87” inches wide with 95 tons. The TRUMPF TruBend 7036 CNC Electric Press Brake is extremely fast moving machine with 6-axis back gauging and high acceleration values that help optimize machine speed. This is achieved with lightweight carbon fiber elements in the back gauge fingers and a gearless electric drive for the beam. This machine’s 40 tons and 40” inches of workspace allows us to be highly competitive with quick turnarounds on small formed parts. Bending metal allows us to transform sheet metal into V, U or channel shapes, allowing us the ability to manufactured parts for a variety of industries. We are able to process material less than 6 inches wide and up to 10 ft. long. Forming is completely reshaping the metal without shaving, cutting, or removing material. Forming changes the physical shape of the material without changing the mass. Our metal forming provides a uniform look and consistent shape with a variety of materials. Our state-of-the-art press brakes bend metal with a high degree of accuracy. We have the ability to control the position and angle of the back-top, to make perfect bends every time. Punching is used to make a hole or an impression in the material. Our punch machine can handle simple shapes or more complex projects, and handles multiple stamps in one stage. This punch process is slightly less flexible than using a laser cutter, but it is faster for repetitive shapes. This press brake from TRUMPF is one of their most popular hydraulic CNC press brakes. The V Series are known as the most flexible, efficient, and premier press brakes in the industry. The V85 features TRUMPF's unique die shifting feature along with an intelligent 6-axis back-gauge, and Automatically Controlled Bending. 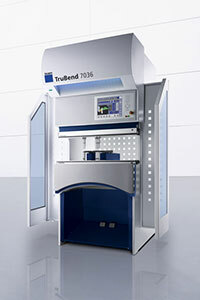 The TruBend series from TRUMPF is the fastest in the world. This extremely fast and flexible machine features high acceleration and certified ergonomics to allow our expert craftsman to work quickly and efficiently to make complex and precise parts in any format. The TruPunch 5000 is the market leader in productivity, process reliability, and flexibility. Through individual automation solutions, this process guarantees reliable and optimal output, even with diverse applications. Thanks to the innovative on-demand drive, the TruPunch 5000 punches up to 1600 strokes/min or marks up to 3000 strokes/min. Hafendorfer Machine, Inc. provides a wide range of sheet metal services including precision machining, sheet metal fabricating, sheet metal forming, laser cutting, welding, bending and forming, custom design, and engineering.